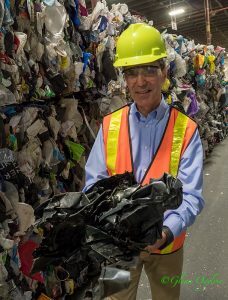 Black plastic — the indestructible stuff of coffee cup tops and roast chicken containers — is being recycled thanks to technology developed by a cutting-edge Sarnia company. In fact, ReVital Polymers Inc. is leading the way in Canada by diverting plastics from landfill and repurposing them for use in a wide variety of useful products. Most facilities recycle No. 1 plastic (polyethylene terephthalate) found in water and soft drink bottles, and No. 2 plastic (high density polyethylene) used in shampoo bottles and laundry soap containers. Toronto and most other Ontario communities can’t recycle black plastic because their light-sorting machines are unable to distinguish or “read” the dark material. ReVital’s process not only targets and reclaims “orphan” No. 2 plastic missed in the first sort elsewhere, it can recycle plastics No. 3 to 7. Keith Bechard, CCO of Revital Polymers, holds a sample of black plastic at the Sarnia facility. Media reports out of the GTA recently advised people to toss black plastic coffee lids and take-out containers in the trash because they can’t be recycled there. That created public confusion with many believing the problem was province-wide. “In Ontario alone, about 1,405 tonnes of black plastics are generated annually. That would fill more than 70 transport trucks parked end-to-end stretching for 1.7 kilometres, Bechard said. The Sarnia company not only takes black and other plastics from Ontario blue box programs in Ottawa and Windsor, but also plastic from Illinois, Indiana and upstate New York. 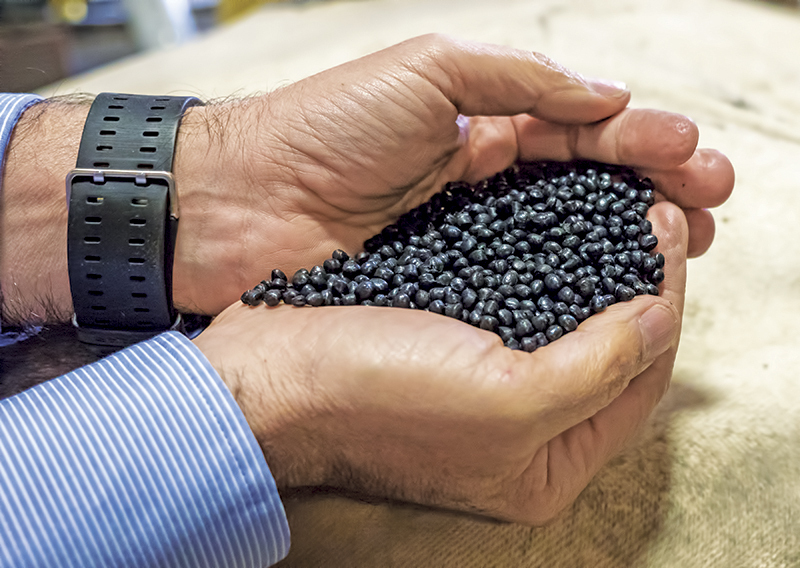 It arrives in bales at the Lougar Avenue plant and is sorted, washed, ground down and run through a high-pressure extruder and turned into clean resin pellets. The process takes less than 25 minutes, and clients can then turn the pellets back into containers, shelving or automotive parts. About 70% of the plastic is sold to General Motors. The Sarnia business, which opened in 2017, is owned by Emmie Leung and Tony Moucachen, both pioneers in the recycling field. The 188,000-square-foot plant employs 80 people and houses some of the most advanced plastics recovery technology in North America. Bechard said 95% of Canadians participate in a blue box program and believe strongly in recycling. “Don’t get sucked into purchasing a brand just because it says it is green,” he said.